Hidden away in the summer 2018 release of Capita SIMS was an extra feature that will make the programme of study marksheets much more useful. Since they were introduced in 2015 (as a response to the removal of levels from the curriculum) the programme of study (PoS) marksheets have been the best way of recording formative assessments for from EYFS to KS3. Each PoS marksheet displays all the relevant statements from the National Curriculum and allows teachers to enter an assessment against each one. The marksheets then calculate the percentage of those statements that have been achieved by each student. There’s a really useful set of analysis reports available too. So far, so good, but there can be hundreds of statements per year in the national curriculum and pupils won’t be taught all of them till the end of the year (or key stage for KS3). 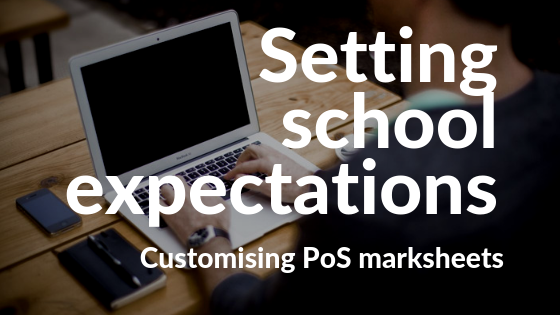 So the programme of study marksheets allow teachers to set ‘school expectations’ as a subset of all the statements in the curriculum. By setting different expectations each term, the programme of study marksheets become much more useable. But the catch was always that the process for setting school expectation was cumbersome, time consuming and had to be repeated each term. Only SIMS users with access to this screen are those defined as ‘assessment co-ordinators’ – so classroom teachers can’t ‘accidentally’ change school expectations. Primary schools will enjoy this functionality, but I also expect secondary schools will welcome this change, as the KS3 curriculum statements refer to expectations for the end of the key stage, rather than the end of the year.